Works on paper by Pamela Hochstetter and Ellen Lazarus are the subject of the exhibition "Layered Expressions" at the Peter Lawrence Gallery, April 13 - May 6, 2012. There is an opening reception featuring wines by White Silo Farm and Winery on Saturday, April 14, 2012 from 3 - 5 p.m. The Peter Lawrence Gallery is located at 703 Kent Rd., Gaylordsville, CT 06755. The Aldrich Contemporary Art Museum is exhibiting James Grashow's "Corrugated Fountain" April 1 to May 13, 2012. Corrugated Fountain is "an enormous cardboard sculpture inspired by Bernini's famous Trevi Fountain in Rome." The fountain has been on exhibition since 2007 and its final stop is at the Aldrich where it will slowly disintegrate over time. Grashow's work makes cardboard seem fluid. It is just one of the surprising properties that make his artwork accessible to people of all ages. The exhibition is also accompanied by a publication and two Aldrich Editions by James Grashow--a cardboard sculpture, and a finely-detailed woodblock print. Guests will be invited to partake in Grashow's project Accumulated Wishes by tossing special paper coins with their wishes on them into the fountain. There is an opening reception from 3 - 5 pm on Sunday, April 1, 2012. The Aldrich Contemporary Art Museum is located at 258 Main St. Ridgefield, CT.
"5@22" features five artists working in different media at 22 Haviland St. Gallery, in Norwalk, CT. The show opens Thursday, March 29, 2012 with a reception from 5:30 - 8:30 p.m. The artists are Lori Lohstoeter, Joe Fucigna, Frank Post, Chris Durante, and Mauricio Higuera. The exhibit runs until April 26, 2012. The gallery's Facebook page is here. The group exhibition Stone Work: Artists' Encounters with Hard Places is on view at the the Institute Library, 847 Chapel St., New Haven, CT from February 11 through March 10, 2012. There is a greeting of the artists on Saturday, February 11, from noon until 2 p.m. Photographer client Keith Johnson is featured in the exhibition. The artists are: Marion Belanger, Frank Bruckmann, Daniel Buttrey, Anne Doris-Eisner, Emilia Dubicki, Keith Johnson, Constance LaPalombara, Roy Money, Kerry O'Grady, Matthew Weber. The exhibition was curated by Stephen Vincent Kobasa. "Stone Soup" featuring artists Judith Secco, Mally DeSomma and Thomas Nackid will be on exhibit at Koenig FrameWorks in Newtown, CT from February 10 through March 19, 2012. The exhibition is a partnership with Housatonic Valley Cultural Alliance's Accessible Art Project. The exhibit is called "Stone Soup" in a reference to the folk story of the same name, with the artists' different talents becoming more than the sum of their parts when put together. The artists' mediums are as follows: Judith Secco, photography; Mally DeSomma, painting; Thomas Nackid, painting/illustration. There will be an opening reception on Friday, February 10, 2012 from 5 p.m. to 8 p.m. Koenig FrameWorks is located at 97 South Main St., Newtown, CT.
Michele Muir's moving black and white photo-essay about Alzheimer's disease, "Every 69 Seconds..." is on exhibit at Brother Chapman Gallery, Iona College Arts Center, 715 North Avenue, New Rochelle, NY from November 1 to December 1, 2011. There is an opening reception Sunday, November 6, 1 - 3 p.m. There will be a special viewing on Thursday, November 10, at 6:30 p.m. presenting the film "I Remember Better When I Paint" with filmmaker Berna Huebner. November is National Alzheimer's Awareness Month, and Muir's photographs highlight with great compassion many facets of the lives of those living with the disease. The title of the show refers to the statistic that in the United States every 69 seconds, another person is diagnosed with Alzheimer's disease. In addition to being an exhibiting photographer, Muir is Director of Communications and Public Policy of The Alzheimer's Association, Poughkeepsie, NY. A large-scale solo exhibition of David Klein's striking 1960s vintage lithographed travel posters for TWA titled "Up, Up, and away!" is being mounted at Scott & Bowne from September 17, 2011 to October 16, 2011. There will be an opening reception on September 17, 2011 from 5:00 p.m. - 7:00 p.m.
"Scott & Bowne is delighted to present a large-scale solo exhibition of thirty vintage travel posters - lithographs by illustrator and noted award winning Kent Art Association member David Klein (1918-2005). [...] The show features a collection of posters from the artist’s own private collection, several of them signed by the artist and all will include estate certification. During the 1950s and 1960s David Klein designed and illustrated dozens of these iconic Jet Age posters for Howard Hughes’ Trans World Airlines (TWA)." The work of David Klein has gained recent popularity due in part to the style of AMC's hit television series Mad Men. They capture iconically a more colorful time when traveling was still glamorous, and illustrators were still respected. Scott & Bowne is located at 27 North Main St. #1, Kent, CT.
Mark Savoia of Still River Editions is included in "At the Edge of Things: Twenty-Four Photographers", a group photography show at West Cove Studio and Gallery, that runs from August 25 - September 17, 2011. There will be an opening reception on Sunday, September 4, 2011 (this is new date, postponed last week due to Irene) from 6 p.m. - 9 p.m. West Cove Studio and Gallery is located at 30 Elm St., West Haven, CT. The show, curated by Stephen Vincent Kobasa, features James Ayers, Christopher Beauchamp, Marion Belanger, Paul Bloom, Joy Bush, Phyllis Crowley, Paul Duda, Ashley Estep, Joan Fitzsimmons, Andrew Hogan, Aniko Horvath, Keith Johnson, Clare Kobasa, Linda Lindroth, Eric Litke, Meredith Miller, Roy Money, Hank Paper, Thomas Peterson, Mark Savoia, Jess Smith, Maria Tupper, Marjorie Wolfe and Stefan Znosko. Multi-media artist and client Matt Frieburghaus will be exhibiting a single channel video at the Snug Harbor Cultural Center & Botanical Garden, 1000 Richmond Terrace, Staten Island, NY from June 18-September 4, 2011. The show is called "Iced" and is labeled a "group exhibition that explores seductive materials and the sublime desire for cool relief during the summer heat." Artists include Betty Bressi, Aaron Carpenter, Kasarian Dane, Ed Davin, Corey D'Augustine, Amanda Dumas-Hernandez, Matt Frieburghaus, Michael C. Johnson, Zerek Kempf, Ben Knight, Rena Leinberger, Elisa Lendvay, Jonathan Leiter, Karen Lofgren, Viviane Rombaldi-Seppey, Tomas Ronse, Allyson Ross, and Gabriel J. Shuldiner. In addition to being a nationally exhibited artist, Frieburghaus is an Assistant Professor of Digital Media at Marist College in Poughkeepsie, NY. Frieburghaus holds an MFA in computer art from Syracuse University and a BFA in animation from the Minneapolis College of Art and Design. There is an opening reception from 6-8 p.m. Saturday, June 18. Koenig FrameWorks in Newtown, CT is presenting their Spring Photography Show from May 6 - May 27, 2011. The call for submissions was themed "Fantasy", and includes 60 images by 33 photographers. The theme was an intentional departure from the traditional, meant to inspire creative responses. Client Paul Berger's photograph, "Enchanted Rainforest" is among those included. Client Elisabeth Levy is also participating. Photographer Ben Larrabee's fine art black and white portraits will be on exhibit during Art to the Avenue May 5 – 30, 2011 at Lexus of Greenwich, CT.
Art to the Avenue is an annual May event during which over 100 artists exhibit in storefronts and local businesses along and around Greenwich Avenue, turning the city into a strolling art gallery. The opening night (May 5 this year) is festive, with opening receptions and entertainment at many of the participating locations. Larrabee's photographs are finely tuned to capture tenderness within families and relationships. Larrabee calls his work "'Moments of Grace' referring to those fleeting yet memorable moments every family has but rarely sees captured in photographs. His photographs show families acting naturally and spontaneously, expressing their spirit and love for one another." There will be an opening reception for Ben Larrabee's exhibition on Thursday, May 5, 2011, 5:30 - 8:00 pm. Lexus of Greenwich is located at 19 Railroad Avenue (across from train station), Greenwich, CT. A .pdf map of the venues is downloadable here. On Saturday, June 11, 2011, the Gallery at Still River Editions will be opening as part of Connecticut Comission on Culture and Tourism's Open House Day 2011. Across the state on that day art galleries, historical properties, museums, parks, and other organizations will be offering free admission, tours, refreshments, and activities. The inaugural re-opening exhibition at our gallery will feature the work of photographers Keith Johnson and Mark Savoia (co-owner of Connecticut Photographics and Still River Editions). Both Mark and Keith were 2010 Artist Fellowship Recipients from the Connecticut Commission on Culture and Tourism. We don't normally have Saturday hours, so if you've been meaning to come visit us and haven't had time during the week, this would be a great day to come out, look at some art, and chat with us about printing/art/photography. We'll have some light refreshments, and look forward to having some of our clients meet each other. It's a hidden little community--folks don't usually get to meet unless there's a mini-pileup at the counter. As the date approaches, I'll list other participating venues in the area. For those who aren't familiar with us, we're in downtown Danbury very close to the Danbury Railway Museum and Danbury Historical Society, and not too far from the Aldrich Museum of Contemporary Art in Ridgefield. Not far from I-84 exit 5, but I strongly suggest following written directions to get here the first time. If you can't make it on June 11, there will also be an artist's reception (probably an evening event), with a date in June to be determined. Regular gallery hours are our normal business hours: Monday through Friday 8:30 am - 5 pm. Zachary Keeting, our friend with whom we shared a studio at City Wide Open Studios last year, sent out a notice about the closing party and "Big Reveal" for SCRAWL Friday, March 25, 2011 at Artspace New Haven. Over the last month and a half, SCRAWL brought individual artists and teams of artists into Artspace New Haven to draw on its gallery walls in a huge game of exquisite corpse. Each drawing was connected to the next without the artists being able to see each other's content. Keeting was part of a team called "The Futurists" along with other artists associated with New Haven's Educational Center for the Arts. Friday will be the first time participants and viewers can see the work in its entirety. 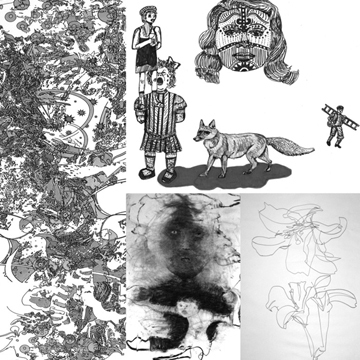 Closing party and "reveal" is this Friday, March 25, 2011 from 6-8 pm at Artspace New Haven, 50 Orange St., New Haven, CT. The reception is free and open to the public. There is a VIP cocktail hour from 5-6, and admission to that portion of the evening's events is $10.